Description: This board is located on I-40 targeting the eastbound traveler. 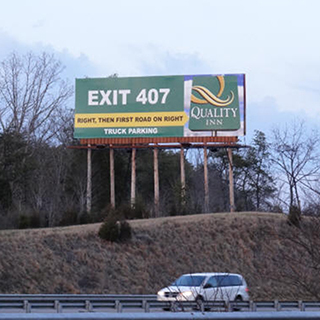 It provides the advertiser opportunity to reach the inbound to Sevierville, Pigeon Forge, Jefferson City, Dandridge, Morristown and continuing east and north traveler prior to the I-81/I-40 split. It has an exceptional read time and is ideally suited for an advertiser to reach both the tourist and the local commuting traffic.